Michael Schumacher would not have made it to hospital after his skiing accident if he had not been wearing a helmet, doctors have revealed. The seven-time world champion remains in a critical condition in a French hospital after hitting his head during a fall on Sunday. Although he has suffered severe injuries, the medical team looking after the German said during a press conference on Monday that the incident would likely have been fatal if he had not worn head protection. Professor Jean-Francois Payen from the Grenoble hospital said: "We believe that taking into consideration the very violent shock, his helmet did protect him of course. "Somebody having this kind of accident without the helmet would not have got to here." Payen added that judging by the extent of the injuries that Schumacher suffered, it was clear his impact with rocks had not been at slow speed. "Taking into consideration what we have observed, that despite a helmet he arrived with lesions that were quite severe, the shock must have taken place at high speed." 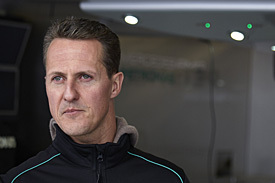 Professor Stephan Chabardes said that the injuries suggested that Schumacher had hit the rocks with the right hand side of his head. "I did tell you there were a number of serious lesions, but I am not going to tell you any details," he said. "The impact was on the right side - he fell on his side. "At the time of the accident he was agitated, but not responding to questions. "He did not have a normal neurological reaction."